The Nebraska Department of Health and Human Services (DHHS) administers and the process for becoming a Certified Nurse Aide (CNA). Nurse aides are also called nursing assistants, and they must meet minimum training and testing requirements to get certification. Once certified, the individual’s name is placed on the Nebraska Nurse Aide Registry. A career as a CNA is often a stepping stone to pursuing additional nursing education to become a Registered Nurse or Licensed Practical Nurse. The following descriptions summarize the steps and requirements to achieve nurse aide certification and to maintain active Registry status in Nebraska. An individual who wants to become a new (first-time) Certified Nurse Assistant will have to complete a Nebraska state-approved training program and pass a competency evaluation program to get certified and to get his or her name placed on the CNA Registry. There are other routes to CNA certification, so the first step is choosing the ideal route based on personal circumstances. The next steps taken depend on the route chosen. In certain cases, an individual can challenge the CNA exam, meaning they are asking to take the competency evaluation exam without going through additional training. Some people can also request an exemption from examination. The certification requirements for new CNA’s requires individuals to complete a 75-hour nursing assistant program, of which 16 hours is practical training. In addition, the person must complete a one-hour Nebraska Abuse/Neglect/Misappropriation Training course on reporting suspected neglect and abuse, making a total of 76 required training hours. As explained in Step 4, there are different training requirements for anyone who wants to work as a nurse aide in an Intermediate Care Facility for Individuals with Developmental Disabilities (ICF/DD). Nursing students who can provide a transcript of nursing courses completed can request exemption from taking the CNA exam. DHHS will review the transcript to determine whether the courses completed include the equivalent of CNA training. The grades in required courses must be at least 70 percent. If the grades are under 70 percent, the nursing student will have to take and pass the competency evaluation program and show proof of completing the one-hour Nebraska Abuse/Neglect/Misappropriation Training. Registered nurses (RNs) and Licensed Practical Nurses (LPNs) who have lapsed licenses may be exempted from CNA examination, if they worked as nurses or performed nursing related services in the prior 24 months. If the license has been lapsed for more than two years, the person must take and pass the competency evaluation exam in Nebraska. Foreign trained nurses can also ask for exemption from CNA examination. They do this by submitting a letter to DHHS with the “Credential Evaluation Service Professional Report” attached. The report comes from the Commission on Graduates of Foreign Nursing School (CGFNS) and is based on a review of the person’s credentials and passing the CGFNS exam. A similar rule applies for nurse aides who passed the Canadian Nurse Licensing exam. The individual must also complete the one-hour training on abuse and neglect. If the foreign trained nurse has not worked as a nurse in the prior 24 months, he or she must take and pass the competency evaluation exam in Nebraska. A person trained as a nursing assistant or equivalent while in the military can also request a review of the training record and exemption from Nebraska CNA examination. 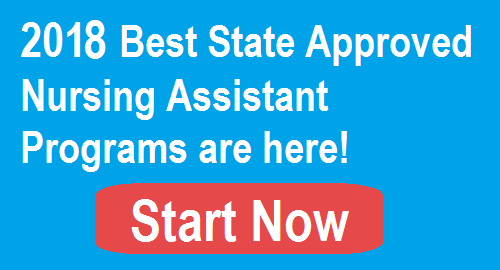 Any individual who must complete CNA training in Nebraska will need to select a program. The listing of state-approved CNA programs in Nebraska includes community colleges, high schools, colleges, career centers, skilled nursing facilities and long-term care facilities. It is crucial to enroll in one of the state-approved CNA classes in Nebraska because they meet federal and state requirements for curriculum, hours of attendance and testing. There are 50 state-approved Certified Nurse Aide programs in Nebraska. The school data is updated in November 2017. Omaha Douglas Promise Health Care Training Center Inc.
Each college establishes its own class schedule. Generally, the cost of training is $400 to $500 for tuition, textbook and exam fee. The student will have other out-of-pocket expenses like uniforms and supplies. For example, Clarkson College in Omaha offers a nurse aide course that is a non-credit professional development course. It takes one month to complete. The program costs are $495 (subject to change) for tuition, textbook, course materials and the exam fee. The student must also purchase scrubs, shoes and a watch. In another example, Central Community College has multiple campuses and also offers nurse aide training. The full-time classes are completed in less than three weeks. The costs of the program are $395 (subject to change) for books, fees and exam fee. Once again, the student will have to buy a uniform, shoes and medical supplies. Some individuals can get free training through Vocational Rehabilitation or Workforce Development. Another source of potential financial aid is the Nebraska Health Care Association. The association offers scholarships for nursing assistant training. It is wise to discuss funding options with the appropriate school staff. Another way to get training costs covered is by working for a long-term care facility or nursing home while training. Federal and state law requires employers to cover the cost of nurse aide training. The individual can only work for 120 days without CNA certification. If a Certified Nursing Assistant in Nebraska is hired by a long-term care nursing facility within 12 months of passing the competency exam, the employer is required to reimburse the individual for training costs on a prorated basis. The CNA courses must cover a minimum number of topics as determined by the state. There are curriculum requirements for training to work in all Medicare/Medicaid funded facilities. There is a separate curriculum for those who want to work in an Intermediate Care Facility for Individuals with Developmental Disabilities (ICF/DD). Basic nursing skills, i.e. taking and recording vital signs; maintaining the resident’s environment; recognizing changes in the resident’s condition, etc. Personal care skills, i.e. feeding residents; skin care; turning, transferring, and positioning residents, etc. Caring for cognitively impaired residents, i.e. communicating; understanding behaviors; appropriate responses, etc. Restorative services, i.e. self-care; assistive devices; maintaining range of motion, etc. Resident rights, i.e. confidentiality, assisting with disputes; avoiding restraints, etc. The curriculum for nursing assistants who want to work in an ICF/DD requires completing a minimum of 20 training hours. The state requires 15 hours of basic personal care training and 5 hours of training in basic therapeutic and emergency procedures. The individual will also complete one hour of training in reporting suspected abuse or neglect. This makes a total of 21 hours of required training. After completing CNA training in Nebraska, the individual will complete an approved competency evaluation program which is the equivalent of a state CNA exam in other states. It consists of a Written/Oral Exam and a Skills Exam. There are 50 multiple-choice questions, and the person must score at least 70 percent to pass. Individuals get three attempts to pass. If unable to do so, the person will have to retrain and retest. This part of the CNA exam requires an individual to demonstrate six skills. The person must pass all six skills in order to pass the Skills Exam. Three attempts are allowed. If the individual cannot pass within three attempts, he or she must retrain and retest. Individuals who complete a school-based training program will test at the school. Individuals who train at a nursing home or other skilled nursing facility must take the test at a facility approved by Nebraska. They will self-register for testing through the Nebraska Health Care Learning Center. Upon successful completion of a state CNA requirements, the individual’s name is submitted to the Nebraska Nurse Aide Registry. Either the school or the testing facility will submit the nurse aide’s name to DHHS for listing on the Registry. Once a name is placed on the Nebraska Nurse Aide Registry, it remains active as long as the person works as a nurse aide within each two-year period. The employer is the only person who can provide employment verification. This also applies to private duty employment. The one exception to the employment rule is if the individual earned certification less than two years ago. If certification lapses due to lack of employment, and remains inactive for more than 24 months, the individual must retest in order to renew certification in Nebraska.